BERNARDSVILLE – Between a new reading program for children, a food pantry and Spanish as a Second Language (SSL) classes, ministry is coming full circle in the Bernardsville area. Twenty people attended the first SSL class, a part of a six week program on March 5 at Bishop Janes UMC in Basking Ridge. The classes are in collaboration with Bernardsville UMC and the neighboring First Presbyterian Church. The classes feature a program called “Who is My Neighbor SSL,” available at Cokesbury and written by scholars in the Northern Illinois Annual Conference where Bernardsville UMC pastor Rev. Kara Berg formerly served as part of the Latino Ministry District Task Force. Berg joined the area’s Latino Task Force two years ago out of passion. The township has been identified as an area where the Latino population is on the rise. With Bernardsville UMC holding the potential to be a place of worship for the Latino community, the congregation’s goal is to become a place receptive to how God’s spirit is moving them to be in ministry with their neighbors, regardless of language or culture. Sam Perez from Bishop Janes UMC has taught SSL for several years and led the first class. A modified Spanish lesson was open for children through song and play led by Berg’s daughter, Evie, who has been in a bi-lingual Spanish classroom since first grade. Many of the Latino families in the tutoring program also participate in the local food assistance program from God’s CoOp Food Bank, where both churches serve. “Those who work with this ministry recognized the need for better language understanding in order to further the relationships we build through mission with our neighbors,” said Berg. Both Bishop Janes and Bernardsville UMCs sent participants to Costa Rica for a ‘Rice and Beans Mission Trip’ in January; a trip Bishop Janes UMC has supported for the past five years. “My hope is more people will go on the trip this year with some of the new Spanish skills they are learning from this class,” said Berg. Eunice Vega-Perez, pastor of Bishop Janes and newly appointed Skylands District Superintendent and Berg have joined forces to seed bed Latino ministry and interest in Latino ministry within their respective churches. 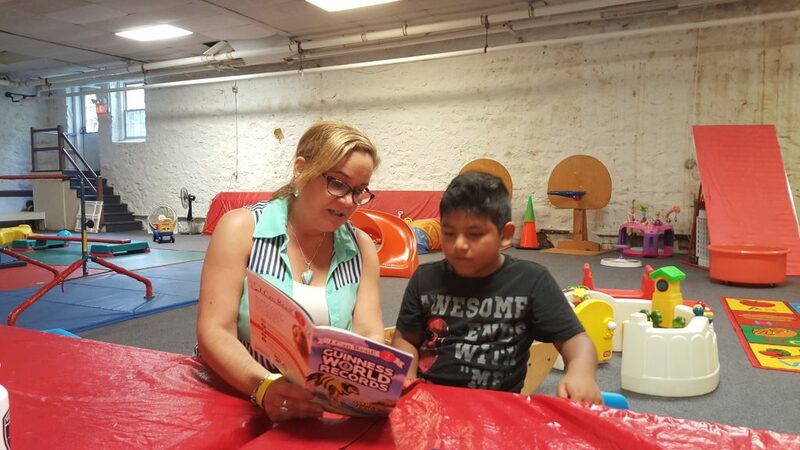 After discovering that English language tutoring for Latino children at the local YMCA ended in the summer, Berg and Perez partnered to bring the children to a free, weekly summer lunch and play day. “We sought to give the kid’s time to practice their reading and conversations weekly,” stated Perez, who helped contact each family who attended the Y program and invited them personally to the church program. “It was a chance for us as a church to really trust the Holy Spirit,” said Berg, who shared that their program budget was no more than $300. Each week, Perez dedicated herself to prayer for the programs children and volunteers. The goal is to offer the summer reading program again in 2019 as well as more SSL classes. The churches continue to offer hands-on mission that explores their relationship with Latino neighbors, locally and globally. Both churches remain committed to inclusive ministry in many forms, recognizing that language can both sharply divide as well as strongly connect. These ministries all grow out of the Latino Task Force established in 2017 to facilitate Latino/a ministry across the Raritan Valley District. Rev. Vega-Perez, the chair of the Task Force, was appointed a special circuit elder by Rev. Drew Dyson, former Raritan Valley District Superintendent, and asked to spearhead this ministry.